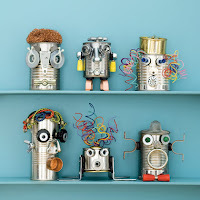 This list of ideas and links to fun crafts kids and families can make with recycled items in celebration of the 40th Anniversary of Earth Day which falls on April 22nd. Any of these projects would be fun for teachers to make at school with students or for moms and dads to make with their children at home. 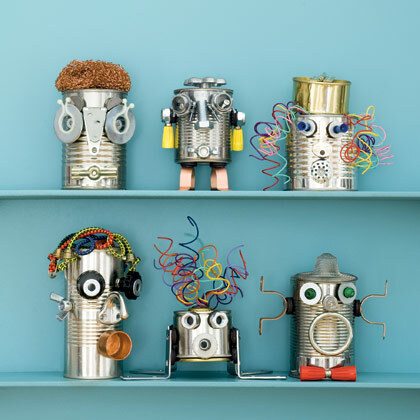 Once again Disney's Family Fun Magazine & Website comes through with some very clever robots you can make from tin cans and household bric-a-brac. Whoever thought this idea up is brilliant. Get the How Tos for this project and others here 32 Family Fun eco-friendly arts & crafts projects. My kids and I will be working on another recycling project idea we got from the current April issue of Family Fun, so stay tuned and we will be posting more about it later. Making art out of reclaimed materials is good for the Earth and fun at every age. What have you and your family made? Please post the links to other ideas you like and don't forget to include links to the recycled projects you and your kids have made to share with us. FTC Disclosure: MommyBlogExpert and family are long-time subscribers to the print edition of Family Fun Magazine. MommyBlogExpert did not receive any payment or other compensation associated with this post. See complete FTC Disclosure information that appears at the bottom of MommyBlogExpert's main page and at the bottom of every individual post on this blog, including this one. Love the coffee can idea! So creative.